The City of Houston (COH) Solid Waste Management Department will embark on its 21st year of Christmas tree recycling(.pdf) after the holiday by providing recycling drop-off sites throughout Houston. All drop-off sites will be closed on New Year’s Day. Trees with artificial snow (flocked) will not be accepted for recycling; they will be picked up on the neighborhood’s scheduled “Junk Waste” day in February. Commercial vendor trees will not be accepted. Living Earth Technology, a leading composting company in Houston, has partnered with the COH to make this a very cost-effective program for the city. OPEN Weds. – Sun., 9:00 a.m. to 6:00 p.m.
Central Neighborhood Depository – 2240 Central St.
OPEN DAILY, 9:00 a.m. to 6:00 p.m. Living Earth – 5210 S. Sam Houston Pkwy. 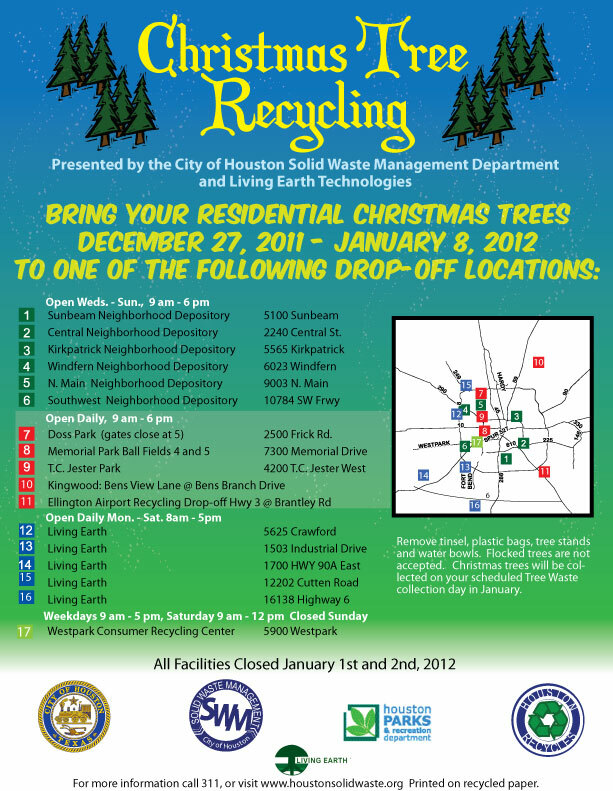 For more information on locations and hours, visit the Christmas Tree Recycling page here (.pdf version).